Delivery service is available to Johor, Kuala Lumpur, Penang and Singapore. 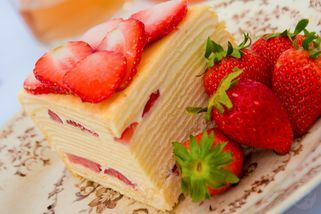 There’s a new kind of cake that’s rapidly capturing the hearts of local cake aficionados – mille crepe cakes. 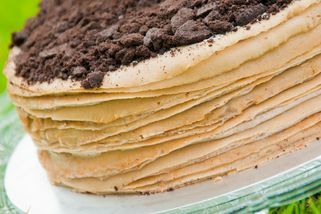 Picture layer upon layer of soft crepe with cream filling in between; it’s hard to imagine anyone passing on a good slice of mille crepe cake. 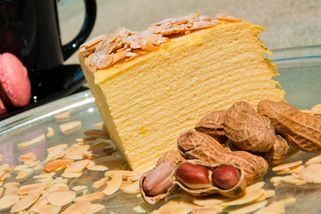 Royal de Crepe is a bakery that specializes in mille crepe cakes and primarily conducts their business online through their website. Customers can browse their menu, place their order and make payment online and arrange either a delivery (subject to distance from the bakery) or self-pick up at selected locations. 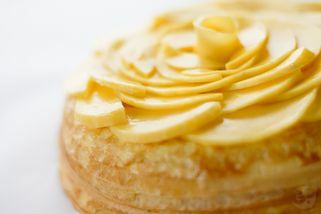 All cakes are made to order and besides their standard flavours they also provide customized cakes listed in their Exclusive Menu for special occasions. Me and my brother try to order it before. We try to see the effectiveness of their delivery system and the look of the cake. Okay, we sounds like 'pesimist' but hey, it's first time for us! Honestly, We love the taste of Mango Crepe Cake. I dunno how to turns it into words.. It's like having a rainbow in your tummy..hehehe.. Try it. I'm sure you guys love it. Just call the number provided here and they'll guide you for sure [how to order it]. Thumbs up!! I don't know quite what is the hype about mille crepes... honestly. It barely tastes like cake, is loaded with so much cream that I don't taste anything but cream (for the record, I hate cream), and barely has any real taste to it... and at the price, I think I'll stick to regular cakes.. or not. I heard so many great things about Royal De Crepe, but when I tasted their mille crepes, it was like.. "meh?". Not gonna buy another one, that's for sure! Crepe fans should try their crepe! 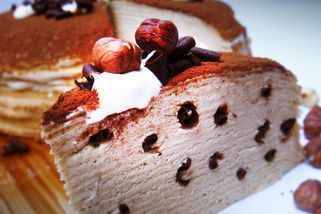 with the on door delivery , i dont need to Q up or drive long way to get nice Crepe cake! 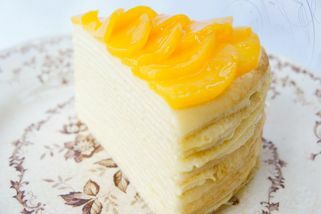 personally like their mango flavor Crepe cake, and definitely one of the Crepe cake i like it most.